There are several pet finch health problems. Finches are great pets for busy people. They prefer their own company and don’t need a lot of attention. They do need proper care, though, and they are susceptible to a host of health problems. Birds conceal their illnesses well, and by the time you notice your bird is sick, it will be hard to treat. 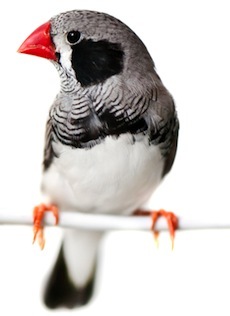 In this article, we break down nine common pet finch health problems. Finches can become calcium deficient if you don’t provide a proper diet. Prevent this by offering chopped boiled eggs with the shells included. Some people prefer to offer only the egg white and shell without the yolk. Calcium deficiencies can be fatal and need to be treated immediately. In addition to the egg and shell supplement, check with your avian veterinarian for additional supplements and instructions. This illness is a fungal infection caused by mold. The condition causes respiratory distress and can be fatal if not treated right away. Symptoms include changes in breathing, gasping, wheezing or a change in voice for vocal birds. See your vet as soon as possible if you notice these symptoms. Treatment is long and difficult with medication. Make sure the bird’s cage and areas are dry so mold cannot grow. This condition occurs when an infection is present on the bottom of the foot. The skin becomes inflamed and may be red or scabbed over. Causes of this condition include obesity and a lack of activity. Check with your vet for treatment options and use perches with uneven or bumpy surfaces. Disinfect the perches regularly. Mites can be present in the airway, on the face or body, or will feed off the bird’s blood externally. Air sac mites infiltrate and infect the airway. If left untreated, the mites can completely obstruct the airway. Symptoms include breathing with the beak open, difficulty breathing or a clicking noise heard as the bird breathes. Other mites attack the face and body. Scaly-face mites create a scaly appearance at the site of infestation. Red mites live off the blood. If left untreated, these mites can weaken the bird. Check the cage in the morning to see if they are present. If you notice the presence of any of these mites, see your avian veterinarian as soon as possible. Legs and wings can be fractured or broken. While some people may have experience creating splints for the legs or setting the wing for the injury to heal, these tasks are best left for your avian vet. Misaligned splints or wing resets can cause further damage. Loose droppings are a sign of diarrhea. There may also be matting of the feathers because of this change. A cause could be a stomach or intestinal upset, and some people recommend a strong, cold tea to ease the symptoms. If it persists, call your vet. Some eggs may be difficult to pass and cause inflammation. The egg may also be partially visible, and the bird may flap its tail during this period. If you wait a few hours, the egg should pass. If the egg does not pass, contact your vet. Be careful not to touch the egg or the area; serious injury or death to the pet is possible. This eye condition is usually caused by a tiny feather growing from the eyelid, but it can also be caused by debris or a foreign object. If you can see the irritant, you can try to remove it. If no irritant is visible, it is likely to be an infection. Flush the eye with warm water and apply an eye ointment. Check with your vet before using anything store-bought, or ask your vet to source it. Beaks and claws need regular trimming, or they can become overgrown. The claws have blood vessels, and you can trim them just like trimming a cat’s nails. The beak can be trimmed, but care must be taken so the beak is not cut too short. If you are not comfortable trimming the beak, leave it to the vet or an experienced groomer. If you suspect your finch is sick, quarantine it in a small cage in a warm, quiet area until you can see the veterinarian. Hospital cages are ideal for quarantine periods if you have one or can obtain one. Quarantining the bird is important if you have other birds to whom the illness may spread. Some illnesses can be transferred to humans. Finches live an average of five to 20 years, and while they may not need much interaction with you, they do need proper care and attention given to their health and surroundings. 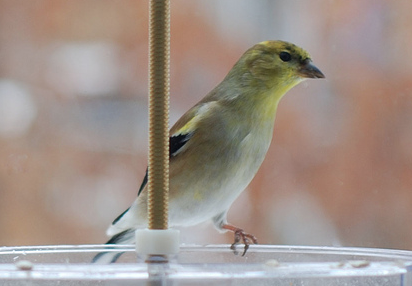 Finches require room to fly for exercise and should be eating supplemental food in addition to seeds or pellets. Perches should be cleaned and disinfected regularly, especially when they are wooden perches that can absorb moisture and bacteria. Always remove fresh food after a few hours, keep the cage clean and dry, and pay attention to any changes in your bird. Even the smallest symptoms, such as puffed-up feathers, can be signs of a more serious illness. Despite the above list of pet finch health problems, these are hardy birds good for first-time bird owners.